We are resuming the work on our new technical support service, which was postponed due to the final stage of DataObjects.Net 4.3 development. - Authentication integration with www.x-tensive.com using OpenID protocol. 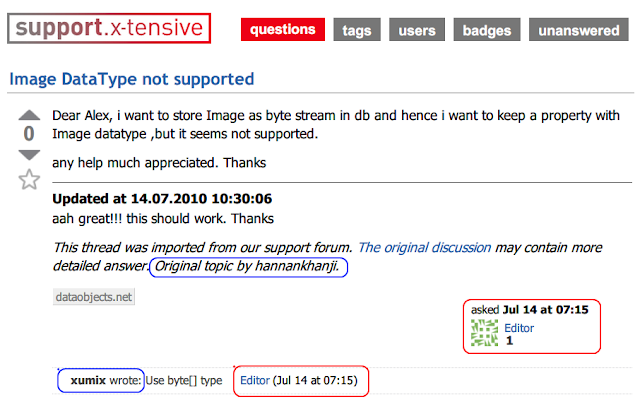 - Migration of topics and answers from currently used forum. where red areas highlight artificial 'Editor' user, whereas blue ones goes for originators, whose names are primitively included into text of topics & comments. In the next release of our support service we would like to sort out the problem of topic and comment ownership. In order to achieve the goal, we're asking you to spent approximately 2 minutes of your time and sign on to support.x-tensive.com. Having list of registered users we could easily map them to correspondent users in old forum. After that is done, topics and comments will be owned by original authors, who could gain karma, vote for answers, mark them as accepted, etc.